Semi-empirical relationships between the ‘optical basicity’ Λ (so-called after Duffy) of solid oxides and the ‘thermodynamic’ selectivity in mild and total oxidation of hydrocarbons have recently been set up. They can be used to determine the optimum acidity of a solid catalyst or to account for its observed selectivity in a given reaction. The oxidic MxOz catalysts were ranked by means of the electron-donor power of oxygen which is represented by the optical basicity Λ. The difference of ionization potential I of molecules when the reactant becomes the product, which represents the variation of electron-donor power during the reaction, was used to rank reactions. Plotting ΔI against Λ for each ‘reaction/selective catalyst’ couple results in straight lines, the equation of which depends on the chemical nature of reactant (alkane and alkyl-aromatics, alkenes and aromatics, alcohols) and on the deepness of oxidation (ammoxidation, mild oxidation, total oxidation). 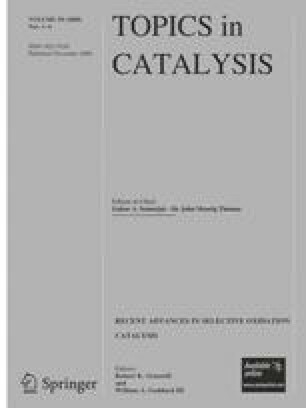 The correlations are used to discuss the behaviour of V- and Mo-based, simple and multicomponent oxide catalysts, in the mild oxidation of C2 and C3 hydrocarbons. E. Bordes-Richard—A partner of NoE Idecat, FP6 of the EU.